John, by the Grace of God, King of England, Lord of Ireland, Duke of Normandy and Aquitaine, and Earl of Anjou, to his Archbishops, Bishops, Abbots, Earls, Barons, Justiciaries, Foresters, Sheriffs, Governors, Officers, and to all Bailiffs, and his faithful subjects, — Greeting. (2) If any of our Earls or Barons, or others who hold of us in chief by military service, shall die, and at his death his heir shall be of full age, and shall owe a relief, he shall have his inheritance by the ancient relief; that is to say, the heir or heirs of an Earl, a whole Earl’s Barony for one hundred pounds: the heir or heirs of a Baron for a whole Barony, by one hundred pounds; the heir or heirs of a Knight, for a whole Knight’s Fee, by one hundred shillings at most: and he who owes less, shall give less, according to the ancient custom of fees. (4) The warden of the land of such heir who shall be under age, shall not take from the lands of the heir any but reasonable issues, and reasonable customs, and reasonable services, and the without destruction and waste of the men or goods, and if we commit the custody of any such lands to a Sheriff, or any other person who is bound to us for the issues of them and he shall make destruction or waste upon the ward-lands we will recover damages from him and the lands shall be committed to two lawful and discreet men of that fee, who shall answer for the issues to us, or to him to whom we have assigned them. And if we shall give or sell to any one the custody of any such lands, and he shall make destruction or waste upon them, he shall lose the custody; and it shall be committed to two lawful and discreet men of that fee, who shall answer to us in like manner as it is said before. (7) A widow, after the death of her husband, shall immediately, and without difficulty have her marriage and her inheritance; nor shall she give any thing for her dower, or for her marriage, or for her inheritance, which her husband and she held at the day of his death: and she may remain in her husband’s house forty days after his death, within which time her dower shall be assigned. (13) In like manner let it be concerning the aids of the City of London. –And the City of London should have all it’s ancient liberties, and it’s free customs, as well by land as by water. –Furthermore, we will and grant that all other Cities, and Burghs, and Towns, and Ports, should have all their liberties and free customs. (14) And also to have the common council of the kingdom, to assess and aid, otherwise than in the three cases aforesaid: and for the assessing of scutages, we will cause to be summoned the Archbishops, Bishops, Abbots, Earls, and great Barons, individually, by our letters. –And besides, we will cause to be summoned in general by our Sheriffs and Bailiffs, all those who hold of us in chief, at a certain day, that is to say at the distance of forty days, (before their meeting,) at the least, and to a certain place; and in all the letters of summons, we will express the cause of the summons: and the summons being thus made, the business shall proceed on the day appointed, according to the counsel of those who shall be present, although all who had been summoned have not come. (16) No man shall be forced to perform more service for a knight’s ee’, or other free holding of land, than is due from it. (18) Trials upon the Writs of Novel Disseisin, Of Mort d’Ancestre (death of the ancestor), and Darrien Presentment (last presentation), shall not be taken but in their proper counties, and in this manner: –We, or our Chief Justiciary, if we are out of the kingdom, will send two Justiciaries into each county, four times in the year, who, with four knights of each county, chosen by the county, shall hold the aforesaid assizes, within the county on the day, and at the place appointed. (31) Neither we, nor our Bailiffs, will take another man’s wood, for our castles or other uses, unless by the consent of him to whom the wood belongs. (52) If any have been disseised or dispossessed by us, without a legal verdict of their peers, of their lands, castles, liberties, or rights, we will immediately restore these things to them; and if any dispute shall arise on this head, then it shall be determined by the verdict of the twenty-five Barons, of whom mention is made below, for the security of the peace. 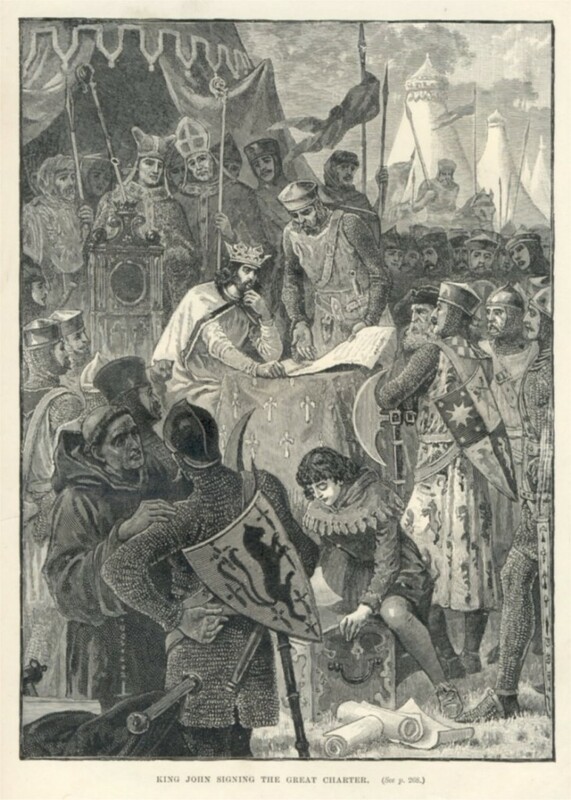 –Concerning all those things of which any one hath been disseised or dispossessed, without the legal verdict of his peers by King Henry our father, or King Richard our brother, which we have in our hand, or others hold with our warrants, we shall have respite, until the common term of the Crusaders, excepting those concerning which a plea had been moved, or an inquisition taken, by our precept, before our taking the Cross; but as soon as we shall return from our expedition, or if, by chance, we should not go upon our expedition, we will immediately do complete justice therein. (53) The same respite will we have, and the same justice shall be done, concerning the disafforestation of the forests, or the forests which remain to be disafforested, which Henry our father, or Richard our brother, have afforested; and the same concerning the wardship of lands which are in another’s fee, but the wardship of which we have hitherto had, occasioned by any of our fees held by Military Service; and for Abbies founded in any other fee than our own, in which the Lord of the fee hath claimed a right; and when we shall have returned, or if we shall stay from our expedition, we shall immediately do complete justice in all these pleas.